Flight of the Argonaut takes the space strategy genre and brings it into virtual reality. Instead of having a view of the entire playing field, the player’s view is limited to what they can see from the bridge of their station. 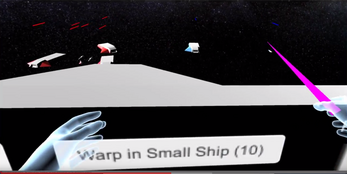 To succeed, the player must command their fleet and destroy waves of enemy ships. Move - Move around the bridge using the Left and Right Joysticks. Select ships - Hover over allied ships with the laser pointer, press A. Move ships - After selecting a ship, point to desired destination and press A.
Download and unzip the file, then run the .exe to play. This game requires Oculus Rift and Oculus Touch to function. Keep up the awesome work and I hope to hear from you soon!